You may be wondering what to expect when you come in for a sleep disorder consultation or complete an overnight study (polysomnogram) at Innovative Sleep Centers. Read here to learn about the process of a sleep disorder consultation all the way to sleep disorder treatment follow up. You may be wondering what is involved in a visit to Innovative Sleep Centers and what to expect. Sleep studies help doctors diagnose sleep disorders such as sleep apnea, periodic limb movement disorder, narcolepsy, restless legs syndrome, insomnia, and nighttime behaviors like sleepwalking and REM sleep behavior disorder. Often these disorders cannot be identified with just a normal office visit—a sleep doctor needs to gather more conclusive evidence while you're asleep. If you are like most of our patients, you were probably referred by your physician. He or she may have ordered a polysomnogram, which is a sleep study test to evaluate your quality and quantity of sleep. This test can be performed either in a sleep lab or at home. During an in-lab sleep study, we use specialized technology that continuously records your brainwaves, heart function, limb movements that may be interrupting your sleep, changes to your airflow and respirations and oxygen levels. If your physician feels a consultation is needed, they will send a referral to our office to meet with one of our knowledgeable providers trained in sleep medicine. You can also contact us directly for an appointment. We will work with your insurance company to obtain pre-authorization for our services. We also work with those who self-pay by offering Care Credit® financing and easy payment plans. Our intake coordinator will schedule a consultation to discuss your specific sleep problem with one of our specialists and decide what testing is appropriate. Our patient service representative will help schedule your overnight sleep test either on a weeknight or a weekend. Most insurance companies and MediCare cover sleep studies. We will contact your insurance company prior to testing to confirm your benefits. If you are having any difficulty sleeping and have not been referred by your doctor, you should schedule a sleep consultation and discuss your specific problem with one of our sleep specialists. We have proven solutions for a wide variety of sleep disorders, so you don't have to suffer a moment longer due to poor sleep. Download the New Patient Registration forms here. If you are scheduled for an in-lab sleep study, you will stay overnight in one of our private and comfortable rooms. Data is collected during the night that will allow your doctor to make a diagnosis and develop a treatment plan. An in-lab sleep study provides the most complete evaluation of your sleep. We conduct overnight studies 7 days a week to accommodate your schedule. One of our specially trained sleep technologists will perform your evaluation. When you arrive for your study the technologist will educate you on the process and begin the hook up. Small lightweight electrodes will be applied to your scalp and skin using a water soluble conductive paste. We will also add respiratory effort belts to your chest and abdomen to measure your breathing, as well as ECG and a probe for your finger to record your oxygen levels. The technician will monitor your sleep from an adjacent room, using a camera and intercom in case you need anything. Sleep lab personnel are ready to help you and make you comfortable during your stay in the sleep lab. After completion of your sleep study, our board certified sleep specialists will analyze and interpret your results. Your study data will first be reviewed and scored by a registered sleep technologist then interpreted by a board-certified sleep physician. This data along with your medical history is used to diagnose your sleep problem and make recommendations for therapy based on your test results and unique needs. This may require an additional overnight stay to ensure the chosen therapy will correct the issue. 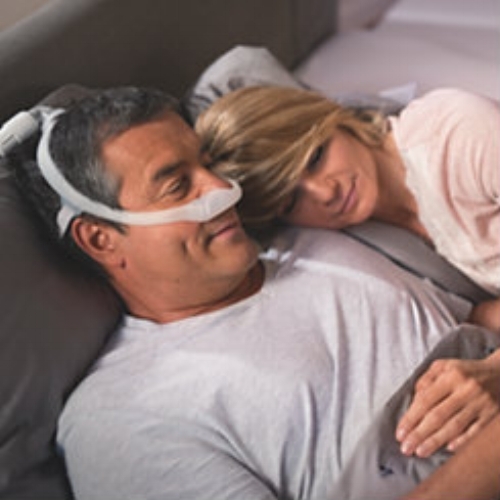 If we recommend CPAP or other PAP therapy, an appointment will be scheduled to meet with our skilled Day Technologist or Respiratory Therapist for complete instruction and proper use of your equipment. We will schedule a follow up soon after you are set up with your PAP therapy or any additional treatment options to assess your compliance and response to therapy. This is a good time to ask questions about your condition, treatment, lifestyle changes and anything else you are concerned about. Your success depends on communicating with your providers so don't be afraid to inform them of any difficulties you may be experiencing. Download the form for your follow up visit here. Discover your true wellness at Innovative Sleep Centers. Call the location nearest to you or Request an Appointment here.